Design an app for listing and buying things from other people nearby. How can people quickly post things to sell, make them look good, and have them be found by the people who would be interested in them? 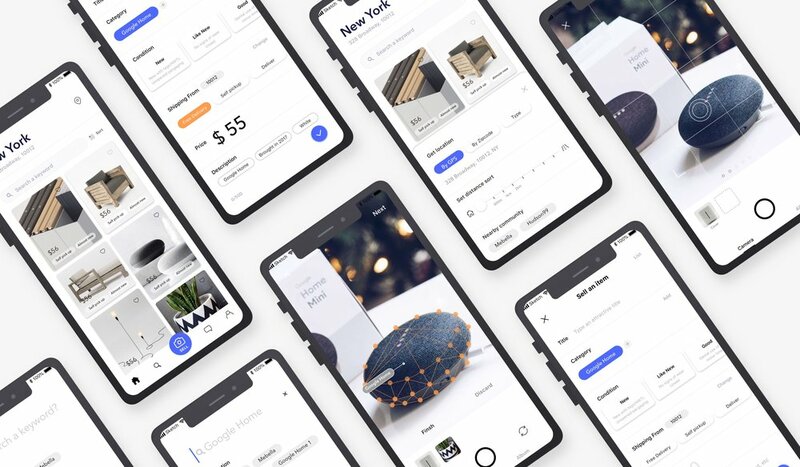 A designed mobile product that focus on modifying the “post a stuff” experience and “explore interest nearby” experience. The product is powered by the object detection technology and more organized by taking advantage of the tag as a filter to list and archive product. 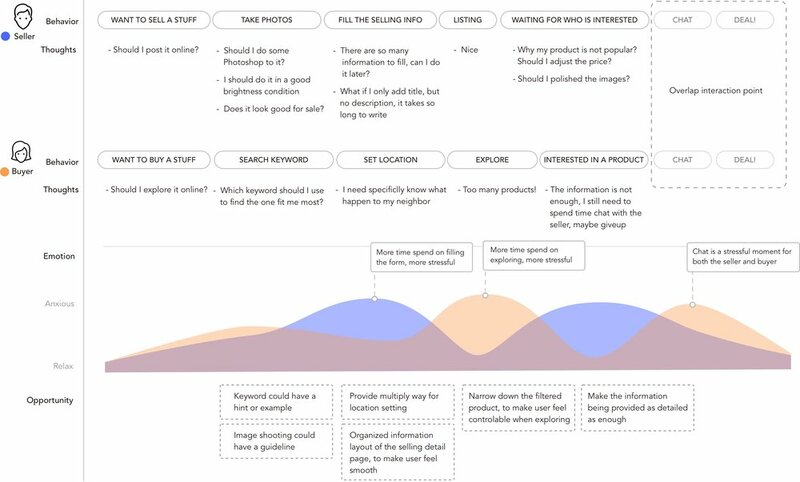 This is an experience design for both the seller and buyer. In an idealized assumption, the seller needs a as simple as possible way for posting a stuff, and to make the images clear and charming. But simple means less information, charming means not 100% real. For a buyer, he needs as much as information as possible and a real profile image of the selling stuff. My challenge is finding the balance of the requirements between the sellers and buyers, to create a sell-buy system in the context of location nearby. What are the existed solutions for people to buying and selling stuff? I conducted competitive research on five products targeted at selling and buying, they are Offer Up, Mercari, Letgo, 5 miles and Xianyu. I compared their information architecture and function highlights and try to have a better understanding of the exist solutions. Followed the competitive analysis, I observed four new users for their first time experience on posting a stuff in these products. I list the general flow of each product below and also asked question to the users based on my observation. Would you prefer to submit information in a detailed way or follow a simple flow such as Letgo? Even if the seller did not post these information at the beginning, they have to provide during the chat with who is interested in more than one time. How do you think about the Image editing function in Mercari and Xianyu? The users want to have the right composition of a picture, but they don’t want to have any filter on added to the photos. The competitive products below are not all specifically targeted at buy and sell stuff nearby, so they provide different approach to the final result in the context of “nearby”. These products provide the different way of locating to the nearby, could you describe how do you feel about each one? When we design the experience in the context of nearby, the location parameter is fixed, no matter the user do general exploration, directly searching or category exploration. How do you like the category? Is it easy for you to find what you want? 1. How people buy and sell stuff nearby in this digital age? Wechat has group based on the leasing building, community etc. People in the group post stuff image and description for sale. 2.How can random images thumbnail looks good in the list view? In which context, people prefer buy stuff from nearby? What does a buyer care most for buy stuff nearby? For the limited time schedule, I have to narrow down the scenario I will focus on. I will designed two flows based on the features above, “post a stuff” and “find interest nearby”. Other features of the product won’t be displayed on the User Journey, User flow and Information Architecture. The below are the result of affinity map based brainstorming. 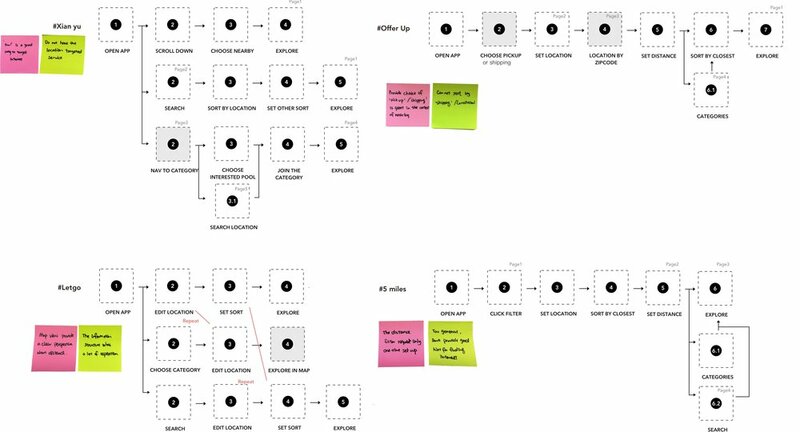 I made the user journey map to understand how the user acted as either the seller and buyer think in the “sell-buy“ system. It is my first step of ideation, trying to be specific with the scenario. I land on the solution based on my research insight, brainstorming and user journey map. I will provide four features in this experience, to faster the “posting flow” and “finding interest” near by flow. I will continue on the prototype and user testing in the next step. The most challenging part for now is that the experience involved two user perspective, the seller and the buyer, the journey of them don’t overlap until they chat with each other. The benefits and pain points of the two types of user are contrast. If it is better for the seller, maybe worse for the buyer. So the challenging part is making the balance between this “sell and buy“ system.